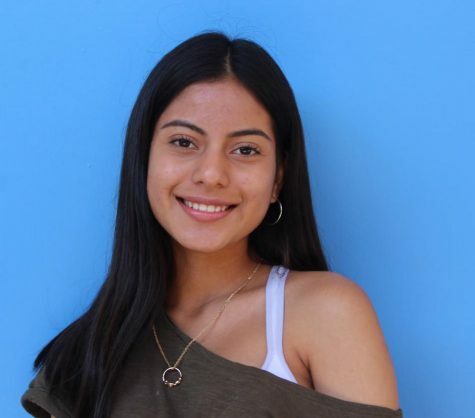 Sara De La Cruz is a 17 year old senior at Birmingham Community Charter High School. She likes to spend time with her family and friends, she also likes to make new friends, she considers herself an outgoing person. This year she is also involved in school activities and she is a member of Senior Council and the Journalism Club. She also volunteers in an animal shelter on Saturdays and on Tuesdays she attends LAVC for an Architectural Engineering class. Sara plans to attend to community college for two years and later on transfer to a UC. She is interested in attending UCLA or Cal Poly Pomona because they offer great engineering programs. Besides preparing for her future, she likes to do a couple of things in her free time. She enjoys going out to eat or exploring new places with people that she enjoys spending her time with. She loves going to the mall, the movies, the beach, amusement parks, and parties. She finds that sports play an important part in her life since everyone in her family is into or have played sports. She played soccer when she was younger, but she no longer plays due to her focusing on her studies. However, she still watches many games either live or on tv--like soccer, basketball, baseball and football. She would like to be more active in fitness, even though she would have to make extra time for that either after school or on the weekends. She wants to have much more fun this year since this is her last year in high school and she wants to make it count and make it memorable.